What a week! Inspired by this wonderful list created by 12 year olds, Samatha and Andrew highlighted it for us via their blogs. Marie-Laure wrote to tell us how she took advantage of the prompt to play and snow day to go sledding with her kids and shared that she was in “was in awe of seeing so much fun and learning going on at once.” During our hangout on Thursday, Alan suggested that we don’t just think about “play” but add more to it like “play along,” “playing with,” “play around,” “playing off of.” Tosch got creative and almost freestyled for us (I won’t ask, I promise) while creating an awesome v-blog in the process. And even Jamie, the self-proclaimed “workaholic,” got some playtime in. As did others. Very nicely done everyone. I am inspired (and, ps. I also lost the game!). This week, let’s continue to play and learn alongside colleagues, with a focus on what it is like to learn, and to wobble, in connected communities. And what are the implications for learning and for equity? What does it mean to wobble? Let’s start to think about this by doing some social reading (and writing) with Antero Garcia and Cindy O’Donnell-Allen using their chapter What it Means to Pose, Wobble, Flow from Pose, Wobble, Flow: A Culturally Proactive Approach to Literacy Instruction. … we offer a framework we call Pose, Wobble, Flow, which will prompt you to maintain the continual focus on personal reflexivity and professional growth that is so necessary for acknowledging how privilege and cultural positionality shape one’s practice. This chapter has been shared on the Marginal Syllabus project and therefore you can annotate and also see the annotations of others from a previously scheduled annotation event (Tech tips: 1. Use the tag #ED677 when you annotate so we can find/see each others comments. 2. Use the eyeball icon to turn on/off annotations as you wish when reading). … As the field of education struggles to catch-up with ever-burgeoning technology that brings the world and our uncertainties about the world to our fingertips, this article theorizes the role of uncertainty in the classroom, particularly as it occurs at the intersection of the global and the local. And then, stop by a site that Bob created with others called Storri at Teachers College at Columbia University. This is a site where teachers share their stories of wobble (and hence making themselves vulnerable by revealing aspects of their practice that raised hard questions). Pick out 2-3 stories from across the different categories to focus on. Makes notes to yourself — What issues were causing wobble for these educators and what complexities were discussed? You can return to any of the blogs we’ve been looking at recently … or look at one of the three linked below. Again, make notes to yourself — In what ways do you see this educator-blogger wobbling? What are the ways they are doing this in public networked spaces? What are the implications? Lacy Manship works with very young learners doing what she called “social assessment” in this Digital Is resource Wanna See the Movie? Note: this may take you more than just this week to accomplish, depending on when you start. You are welcome to keep going with it into next week and I will try to account for that in my planning. Keep a journal or diary (digital or nondigital) and begin listing the areas of your practice that you continue to struggle with. Prioritize those areas that require the most in-depth scrutiny. [slight edit] Do you think any of these are poses? If so, make notes to yourself about this. Try jotting brief notes in your daily lesson plans or recording a few words on sticky notes that will later jog your memory about classroom events related to your wobble. If it’s easier, you can even record voice memos on your phone or computer and listen to them on your way home to reflect on how your teaching went that day. As you interrogate your wobble by inquiring into your practice, what insights are you finding? Where are you experiencing flow? Use the same process above to reflect on your students’ work. Seeing this as data for meaningfully informed wobbling, what are your students producing, and what does their work say about your classroom’s culture, your teaching practice, your understanding of who your students are? Don’t forget that your students are the best source of information about their own learning. Talk to them and try to find common ground. Try these suggestions for one week. And then share a reflection on what you learn in the process of doing these things. If you are comfortable sharing notes you took along the way, feel free (but always consider the public nature of blogging). Otherwise just keep those notes to yourself but continue to hold onto them through the semester. Remember in your reflection to come back to our main questions, ie. what is it like to learn, and to wobble, in connected communities? What are the implications of wobble for connected learning and equity? *If you aren’t teaching right now, think about something else you do where you are continually assessing and adjusting your practice. This could be at work, at the gym, through a hobby, at home, etc. … even though the model as we’ve described it above often sounds individualistic, we don’t intend for it to be. In fact … we have found that we go through P/W/F cycles most successfully when we collaborate with colleagues who provide moral support and at the same time challenge our thinking. This week, start to identify some allies and mentors for yourself or others who you might support you when you wobble. Are they people you work with or connect with through school? Are there networks to connect to, professional alliance or organizations that can be supportive? What about some of the new connections you’ve been exploring, both on and offline? Where do you as an educator find moral support while challenging your thinking? Why I love Teaching and Tweeting! Finally, if you are up for it (no pressure – totally for fun/experimenting), it is Valentine’s week and love is in the air. Why not share with the world what it is you love about teaching? 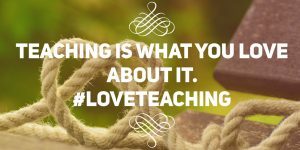 Check out #loveteaching for more about how this works and why. New or not so sure about Twitter? Many educators are using twitter to connect with colleagues and also to engage in discussion about education as professionals in the field. If you are interested, the Studies of Literacies and Multimedia (SLAM) Assembly of NCTE is launching SLAM School, a new bi-weekly online web series and class #1 (lead by Antero Garcia) was on Learning to Tweet. Check it out. Where else do you already hangout out online and want to start a discussion with us … Instagram? Others? Make suggestions as part of your Find 5s if you think it can be supportive. And finally, there is a Connected Learning Network Google community at Arcadia that was set up to support sharing across folks engaged in the Connected Learning Certificate Program. You are welcome to join this and share your blog post links there too if you want to grow your audience. Happy Monday! It’s been three weeks already — congratulations for getting connected to each other and for sharing. That’s been the goal of these first weeks — to get connected and practice sharing with each other. Nice job everyone. In the weeks ahead, we will continue these same practices — reading, connecting with each other via social media and collaborative tools, and continuing to experiment. The focus of the next three weeks (see syllabus) is on theories of knowledge, learning and community — and to kick it off, let’s start with play, theories about play, and the implications of play for equity in connected learning and teaching. Find a few friends and try Global Thumb-Wrestling. Find Play in Things around you and create a game of your own. Try a Game for Change. Connect to a current online event called “Network Narratives” or #netnarr — this week they are focused on improv online. Participate by doing an Daily Digital Alchemy. Try some augmented reality with some suggestions from Edutopia. Do you like music or singing? Connect with others via Smule. Do you do STEM? Check out NYSCI’s suite of Noticing Tools for middle school students (and give them a try them yourself!). The rules are simple: 1) When you think of The Game, you lose The Game. 2) When you lose The Game, you announce it to those around you. As you play, whatever you play, jot down some notes to yourself about the experience: What do you notice about about your play? What ways do you approach it? What questions arise for you? What experiences do you draw upon? What comes hard? What is easy? What have you learned from playing today? Mitch Resnick, the founder of the Lifelong Kindergarten program at MIT Media Lab, writes about playful ways to support creative thinking in his article All I Really Need to Know (About Creative Thinking) I Learned (By Studying How Children Learn) in Kindergarten. Let’s connect now with James Paul Gee on Learning With Video Games from Edutopia and then go a bit deeper with the opening chapter, Semiotic Domains: Is Playing Video Games a “Waste of Time,” from his very influential book What Video Games Have to Teach Us about Learning and Literacy. Coming back around to thinking about equity, this article from the Washington Post names a ‘play’ gap in learning. Our misguided effort to close the achievement gap is creating a new inequality: The ‘play’ gap. Let’s remember what we already watched from John Seely Brown re: the role of play in rapidly changing environments. In our playing we often make things — sometimes it’s a score, often it’s sense of satisfaction, and other times its an artifact, a new connection, or maybe a new way of thinking about things. Share with us what you made through your play. You can blog as usual or try something different like a “vblog” (ie. you can record your thoughts on video and post those to your blog instead of text), a screencast, a collage etc. Show us the ways you played and then tell us what it’s making you think about in relation to connected learning and equity. What questions does it raise? Finally, add a goal for yourself this week: How can you incorporate more play into the semester ahead? Find 5/6/7 things — from each others blogs, the readings, and other work you are doing — that you think would support you or others in your life to play a bit more. Remember to read each other’s blogs while you do this searching; find links to each other’s work here. You might be interested in this blog from last semester of ED677. Robert Sidelinker wrote this post about his work with games in his classroom, 3-2-1 Blastoff! Just a reminder that this week we will meet on Thursday night 2/9 at 7:30pm ET via Bluejeans. We will focus on checking in on how things are going, the genre of blogging, and play. A key goal of this class is to design connected learning opportunities for ourselves and youth that are geared towards equity. But what do we mean by equity? And how do we get there in a “highly stratified and unequal society”? This week I’d like us to consider the ways that we think about equity, the ways we approach it in our work, and how we connect with others to build more equitable environments as educators. What do we mean by equity? Selvi kicked us off this past week by asking this same question and sharing an image describing differences between equality, equity, and liberation. Thank you Selvi! Let’s try to make sense of equity this week and start to connect it to our learning. Here are a few things you can do and explore and folks you can connect with. This week I’d like you to pick 1-2 of these 5 options … or design something else that feels right to you. Right from the start, many of you have asked about the equity component of this class in relation to connected learning. Let’s think more about that together by looking at some work that teachers are doing to design for connected learning opportunities with their students. Noting, of course, that these are simply short snippets of the work, in what ways does it seem that interest and equity play out in these stories? What would you want to ask the teachers themselves about equity and connected learning? Here is a fascinating blog post by Craig Froehle (@CRA1G) the creator of the original image that Selvi highlighted: The Evolution of an Accidental Meme: How one little graphic became shared and adapted by millions. As you read through this story, do any of these images reflect your thinking about equity? If not (or kind of), imagine how might you remix or remake this picture to describe your thinking about equity. We might, for example, wonder what about the interests of the kids? How might, in the words of Dewey, the matter at hand be of “immediate and personal concern, even to the point of actual participation?” In what ways does social interactions fit it? What’s in those boxes after all? Educators in the Aurora Public School District in Colorado (APS) have been inspired by this meme to support a set of conversations across their district that they share and tag online as #apsmovestheboxes. Joe Dillon (@onewheeljoe), one of the hosts of Marginal Syllabus, is a colleague and an educator in APS. He is also a founder of another related conversation called online called #techquity. Play around with it this meme yourself and share what you come up with. If you’d like to connect with folks further, you can find @CRA1G and @onewheeljoe on twitter and I’m sure both of them would be interested too. Read this article from Teaching Tolerance to learn about their work as well as explore their working site/resource above. What have been your experiences in using technology to support equity in the way they define it? Share your thoughts on your blog and if you feel comfortable, you can also reach the San Diego Area Writing Project on twitter and I know they’d love to hear from you too. 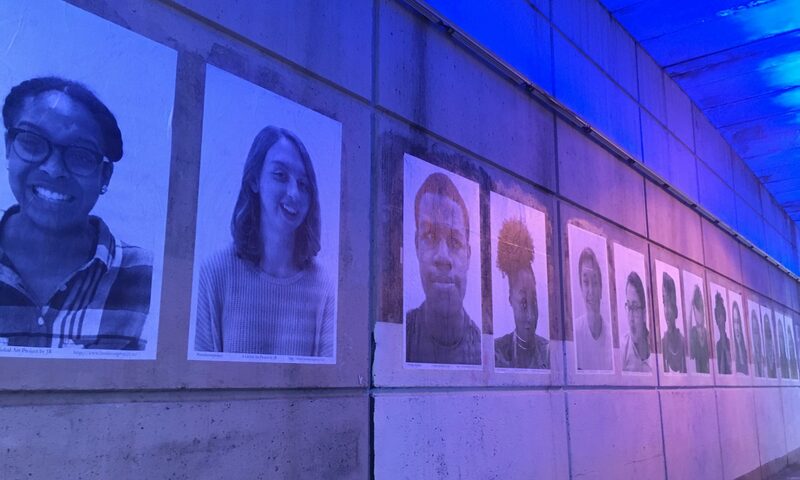 To connect with our local environment, we might consider how, in a district that is more than 70% African-American and Latino, a group of educators in Philadelphia just wrapped up a Black Lives Matter Week (inspired by similar recent work in Seattle). On the Working Educators Caucus blog, they write “If society continues to marginalize, murder, and devalue Black and Brown lives, then there is little hope for America to ever reach her fullest potential.” Follow and connect to resources they have shared and some of what they have been up to and continuing conversations at #blmphled. In what ways do inequities and injustices in our communities impact learning and our teaching? What are some ways that you might have talked (or could imagine talking) about some of those issues in your context? What might be the implications for all learners? What else is current in the news? This weekend, for example, there have been protests in the streets and airports around immigration and refugee issues prompted by changes made by the new administration here in the U.S. Many of our students, or parents of our students, are immigrants or refugees themselves. What resources are available to connect these conversations and interests of our kids in the classroom? KQED Do Now puts out weekly prompts and activities to support students and teachers in engaging in research and writing about current events online and via social media. This week the topic is the first 100 days of the new U.S. Administration and you can follow the conversation online at #DoNowFirst100Days. Do Now are created to span a range of topics, from current news to science and the arts. Check out a few past Do Now resources and opportunities and see the resources available and how youth are responding online (there are comments as well as hashtags to follow). Share what you find and reflect on what the implications might be for connected learning and teaching. How can you connect to other educators working to build equity in the area/s you have been exploring so far? This week try to make at least 5 new connections that you think might help you to continue to think about equity and connected learning. Here are a few tips … While you are reading the links above, do you notice the different ways that media is being used throughout? What hashtags are you noticing? What educators names can you click on to learn more about? Who can you google to find them blogging or tweeting online about similar issues? What new blogs or learning forums do these resources connect you to? Are there physical locations where things are happening? Are there online events coming up that you can connect to? Make some notes and start tracking what folks are doing in these areas and where. This week, I encourage you to share what you find … either new connections and/or insights of interest from your classmates and others around issues of equity and connected learning. Annotation: Did you enjoy annotating with Hypothes.is? If so, I encourage you to use it throughout this course to annotate articles you are reading and want to share, etc. You can go to their website and drop in a link to make a new annotatable link at any time; you can also down a Chrome extension that will allow you to turn annotations on/off in your browser. You can also start groups in Hypothes.is to do more private/small group annotation. Ps. Hypothes.is is a plug-in on this ED77 blog. Feel free to use it to highlight notes to yourself or comment. If you comment publicly, tag your comments #ed677 so we can also find them. Another tool of note: colleagues of mine also use Now Comment which also now supports video annotation of Youtube and Vimeo videos. Twitter: In case you are curious about twitter and don’t know where to start, here are a few links that might he helpful. Here is the video that I (quietly) made this evening to celebrate the great work you’ve all been doing and encourage us on. I threw in a few interests of my own in the mix. To see what everyone else has shared so far, find our collective blog posts here by clicking on Home/Our Blogs above. (Note that you can find Samantha’s blog here while I sort out how to connect it — sorry Samantha!) Visit the blogs directly by clicking on their titles under “Contributors” in the right navigation bar. This week we will keep working on “getting started” while we also dive into one of the key values of connected learning: participation. Connected learning takes root when young people find peers who share interests, when academic institutions recognize and make interest-driven learning relevant to school, and when community institutions provide resources and safe spaces for more peer-driven forms of learning. … These connected learning environments ideally embody values of equity, social belonging, and participation. As we explore participation this week I’m prompting you to participate in something that is probably very new to many of you — an experiment in social reading and online annotation. Check out the details below. This week we have an opportunity to connect with other educators via an online project about social reading and annotation called the Marginal Syllabus Project. This project “convenes conversations with educators about issues of equity in teaching, learning, and education.” To facilitate this, Marginal Syllabus uses a tool called Hypothes.is (more details about how to use this tool are available below). Join the Marginal Syllabus online this Wednesday, January 25th at 6p ET (3p PT) for a conversation with Christina Cantrill, Associate Director of National Programs for the National Writing Project. The Marginal Syllabus convenes conversations with educators about issues of equity in teaching, learning, and education. … A hallmark of the Marginal Syllabus are monthly web annotation flash mobs. These flash mobs occur via the annotation platform Hypothes.is, and are interest-driven conversations with educators and authors about issues such as digital redlining, curriculum design, critical literacy, and the politics of educational technology. On Wednesday, January 25th please join Christina and some of the participants in ED677 at Arcadia University in reading and discussing via annotation the first chapter from John Dewey’s classic book The School and Society. Visit Marginal Syllabus resources for additional information, including directions for using the Hypothes.is platform and joining the public conversation. I realize not everyone can come to this and there is no problem/no penalty if you don’t. You can annotate at any time so there is no pressure — just try to do it sometime between today and next Sunday. But, if you can join at 6pm ET on Wednesday, it should be super fun because others will be there with us too. Make some notes to yourself off-line in a notebook or something else. Feel free to take your time reading this speech and don’t feel you need to comment on everything. Make some notes for yourself instead: What does this speech make you think about? What questions does this speech raise? Reflect back on what you read this past week from the Connected Learning Design and Research Agenda. What are some of the assumptions about changes in schools and our society today that they mention? Make notes to yourself about these too: What resonants to you and your experience? What raises questions? Move onto another speech by John Seely Brown called The Global One-Room Schoolhouse. This animation is based on a keynote he gave in 2012 at the Digital Media and Learning Conference. Again, takes notes for yourself: What resonants to you and your experience? What raises questions? Here’s a screencast on how to use Hypothes.is on the Marginal Syllabus website. Find at least 3 things that you would be comfortable commenting/annotating from the text in public. What is important about the relationships between schools and society? How might what Dewey wrote at the turn of the last century still be relevant today? What ways does Dewey reflect what John Seely Brown talked about? How does it relate so far to your readings about Connected Learning? What does this make you think about in terms of equity (or inequity) in learning today? Reflect on your participation in this Marginal Syllabus event and/or shared annotation of a public article. If you haven’t posted to your blog yet, this might be a good moment to try that. You can also post to Canvas if that’s more comfortable for you. This week go back to each others blog posts and find five things that excite you about participation and opportunities to participate. Please post what you find to your blog. This week: In addition to the optional annotation event on Wednesday, there is an online meeting for this class on Thursday January 26 at 7:30pm ET. I know that not everyone can come and that is fine — I will record this gathering for those of you who missed it. We will use Bluejeans for this meeting and I will send you an invitation to attend. Into the semester: Since not everyone can meet on Thursdays, we will sometimes meet on Fridays at 7:30pm ET too. I will update the calendar to reflect these options. Please note that while I’d love you to try to be at these in-person gatherings, if you can’t make it we will record them and you can view the recorded version at a time more convenient to you. I am Christina Cantrill and I work for the National Writing Project as an Associate Director of National Programs. I am excited to work with you this semester. My background and experience is based on working alongside writing project educators exploring the implications of digital media on learning and literacy. A few key places to connect to some of that work is at Educator Innovator. I am excited to have this chance to work with you and all and am keenly interested learning more about you. This first week we will take the time to introduce ourselves while we also get ready for the weeks ahead. What does “connected learning” mean to you? Take a few moments to yourself and jot down some words that you think of when you read that phrase. Note that there are no wrong answers to the question because whatever it means to you is probably exactly right — there are many ways to connect (both on and offline) and to learn through these connections. Keep these notes for yourself somewhere and return to them throughout the semester. When you do you can ask yourself questions like this: what might be changing about your ideas about connected learning? What is staying the same? And why? Although we will be using Canvas to a certain extent, I am interested in us exploring and using a variety of tools that are on the web. I have set up this blog for ED677 Spring 2017 and encourage you to start here. Please begin by pulling up the syllabus and doing a close reading of it. I’d also like you to respond to it by making comments/annotations in the margins. Here are some questions to get you started: What excites you about this course? What raises questions? Note that our syllabus is a Google Document. You can use the “commenting” tool to make comments and ask questions that the rest of us can see and respond to. You can also use the color highlighter to highlight parts you think are particularly interesting or exciting or maybe even a little odd. Go ahead – you won’t offend me and I’d like to know what makes sense and what doesn’t before we get started. Our readings this week will give us some basic background information about a framework of learning or “an approach to learning” called Connected Learning. Connected Learning Research Report and Agenda by Mimi Ito, et al, will provide some background and context. Then jump over to Educator Innovator and meet my colleague Kevin Hodgson in Practicing the Principles of Connected Learning. Finally, in getting your own blog set up this week, there are several related readings and resources to check out along the way. Here is a prompt to respond to by making something — you might want to make a blog post or you may respond using a another form of communication (drawing, video, etc.). This prompt will be shared with the rest of the class and, ideally, publicly. It is meant to introduce yourself as part of our ED677 Community. Once you can make your blog, you can post your response there. If you are still not sure about posting on the public web, you are welcome to post in Canvas which only our class will see. As I mentioned in the syllabus, each week we will each find things online to share and reflect on that are about each other’s work and/or the larger field of Connected Learning. I’d like you to start practicing this process this week. You can find things to highlight in your fellow classmates work (ie. their introductions and/or blog posts) or you can highlight other things you find online that you think address the topic this week, ie. honoring our interests and connecting online. Have fun with this as if it is a game (because it kind of is!) … for example, if it is Friday, then find 5 things and think of it is “Find 5 Friday”. If it is Saturday though when you get this, then you can “Seek 6 Saturday.” And if it’s Sunday, the “Search 7 Sunday” is perfect. Here is an example from 2014. Notice how Lizzy writes something about each one and then makes a link to where she found if the post is public and online. If the post is not public (for example if it’s on Canvas), please note where we might find it. This course will encourage you to use a range of online tools and resources to support connecting to each other and to the wider world. Here are a few steps to make sure you are connected this week. Ready to set up that blog I keep mentioning? Okay, great! We will each maintain our own blog to share writing and media with the wider public throughout the course. This week you should create that blog (or set up a blog you already have to work for this course). Once created, we will connect all of our blogs to our ED677 Spring 2017 class blog. I created a guide to help you with this process. Once you get it set up, post something to say hello and introduce yourself! And then submit your blog here. Every other Thursday at 7:30pm I’d like to meet online via video. This would make our first video meeting would be on January 26th and we will be joined by Dr. Kira Baker-Doyle. If you cannot make this meeting, please email me right away and let me know and we can work out how best to do follow-up. If, however, Thursday evenings don’t work for you at all through the semester, please send me evenings that might in case adjustments can be made. Email me directly at cantrillc@arcadia.edu.